Notasulga Fire Rescue: 334-257-3444. Interested in joining or have questions in how you might assist the town during emergencies? The NVFD meets every Thursday at 7pm in the fire house. Local Businesses - for your shopping pleasure and Food Pastries. Cookie Jones Cookie Co. 334-552-2864. Cobblers, pies, cupcakes, cookies, brownies. Desserts & Stuff, 334-421-7245, mrs.jackwash@gmail.com "Made from Scratch. Made w/ Love"
Mrs. Ernestine's Pound Cakes, "Each One Made from Scratch with Love." All sorts of cakes and pies. I am living testimony to the variety, flavor, and texture to her cakes. Email and call 937.238.4039. 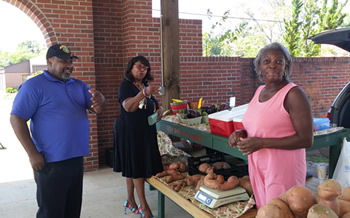 You can conveniently purchase her baked goods at the Tuskegee Farmers Market from 8 am to 2 pm every Wednesday and Saturday, corner of Elm and Spring Street. Besides her excellent baked goods, she is a very pleasant woman, whom I first met in Tuskegee. 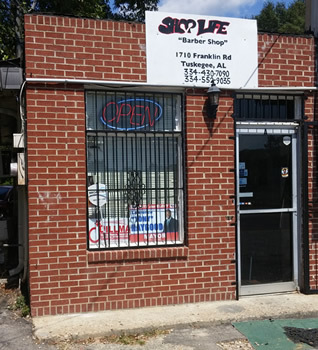 ShopLife Barber Shop, 1710 Franklin Road, Tuskegee, AL 36083, Visit David and Vern, two fine young men cutting hair, 334-430-7090, email. Let at the campaign sign in the left corner of the window. SOAR, Inc. Serving Others Accepting Responsibilities, Andrus Love, CEO and Founder, www.soarinc.org 334-354-9745. "Our goal is to enhance life skills through activity based services by focusing on areas like community service, youth development, social welfare, bullying, hunger, parent support and education." Ms. Marilyn Cleaning Service, advertisement, cphone 334-559-1040 or email. "NO JOB TO LARGE OR SMALL." Downtown Event Center, Opelika. Your place for reunions, weddings, conferences, you name it. Give Lisa, owner and manager, a call at 334-705-5466. She'll ensure your event is memorable and one you'll not be disappointed with. Ava Anne's Honey Bees, sandersrussell@hotmail.com, Russell Sanders owner. My Secret Garden, 2877 County Road 31, Notasulga. Seasonal vegetables such as romaine and leaf lettuce, onions, herbs, beans, and blackberries. Organic raised and processed chicken. Shirley's Garden, Bradford Farm, 600 C.R. 49, Tuskegee, 334-332-4805, sbrad7005@gmail.com. Photographed at the Tuskegee Veggie Market. Wolf Creek Vineyard mushrooms and blueberries. Hughes Auto Parts: I drive to Auburn and Tallassee for my automotive and tractor supplies than shop here. Ice cream - owned by Brett@DothanIceCream.com 334-803-9898. Nice young man, I met in Eufaula. MandMThrift.com - Leaving Notasulga toward Tuskegee, directly past the road bridge on the (L) side of the road you will find Murray Willie and Pamela Tamala's M&M Thrift Store and BBQ pit. Contact: 334-401-1768 or email. Debbie's Plants debbies.plants@yahoo.com Notasulga. Debbie's plants are not your average attractive house and outdoor plants! I have visited with her and Debbie loves her plants. 5LINX by Angela R. Hamilton with many products and services at the convenience of shopping on-line. Email Angela from the contact page. Beautiful unique boulder signs for home and business, you must see for yourself. Contact Boulder Designs partner Jason Hurst at j.hurst@boulderdesigns.net and 334-524-5984. Derick Thomas Construction Met Derick after he found my wallet in Auburn, conducted an internet search, called me, and came out in Hurricane Nate' rain with his family to meet me in Loachapoka to return it with nearly $150 in it. Hellva nice and trustworthy guy. 'sides his wife served our county wearing the USMC uniform. And ya' all know how I feel about the Corps. Geiger's Septic & Port-A-Toilets Service LLC, Marcus Geiger, owner gbss1121@att.net, cp 334-59-5418, Valley, AL. House Doctor 334-401-1556 t0lbertgreene@gmail.com Based in Tuskegee, willing to travel to Montgomery and surrounding areas. Specialize in remodeling, painting (thank goodness for people like him), dry walling, plumbing, decks, and pressure washing. Michael's Lock, Stock & Barrel, email and 334-707-1776. "New or old Airgun Repair, Restoration & Accessories"
Repair Clinic for advice, videos, parts, and friendly and well informed customer service for appliance, heating and cooling, and power tool parts. http://www.repairclinic.com/ or 800-269-2609. Ron's Appliance Service and used sales and parts - 334-502-0081 Roy's store is in Auburn. Because of the city and county business license fees he no longer will service Notasulga. Is that not restricting, as compared to regulating, commerce as our constitution provides? SeriousSoundsEnt, right here in Tuskegee, offers sound set up for bands, weddings, singers, and full service catering. Satese Henderson, CEO, djskegee@gmail.com 334-421-1106. Sock Development Crew, Duane Minley, duaneminley@gmail.com. "We also do Church, School, Sports, and Cheer all events. Spicer's Music Shop, your supply for musical instruments, lessons, practice stage, jamming, and a good time. Call our neighbor and founder Tim Spicer at 334-329-7529. Big Blue Towing, bigbluetowing@bellsouth, 334-887-5446, 334-749-0546. Have used Big Blue twice and most pleased with their promptness and professionalism. Jay's 24 hour Towing and Lockout service 334-421-9944 Tuskegee. They also move sheds, buy and move old cars. I needed service recently while in Tuskegee and Jay was the only of 4 services I called who responded. Family business. Ask for Jay. Tiger Tire Towing, 1994 Wire Road, Auburn, 334-748-4448, 24-hour roadside assistance. Ask for Pete Yarbrough, who responded immediately and was very professional, courteous and polite while towing my truck.